A press release just out has formally announced the title of the first in a new series about the Halo forunner. 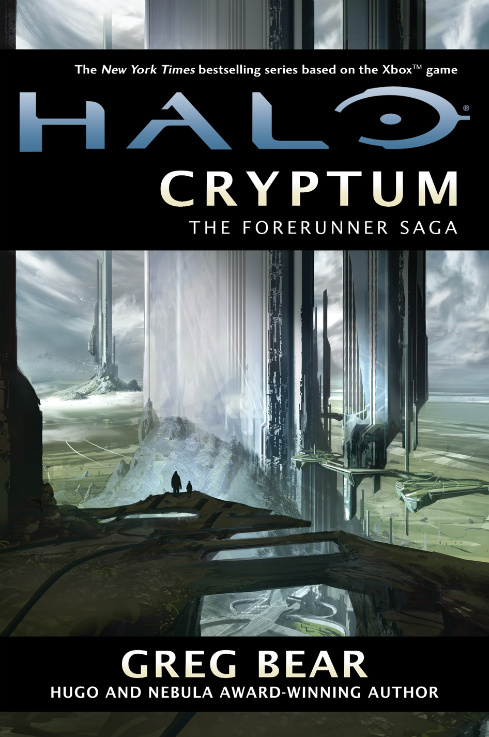 So named Halo: Cryptum, this will be the first of the Halo novels that goes really in depth as to the history of this race. I imagine things only hinted at in the games and other novels will be revealed as the seriies goes forward. New York, NY - Friday October 8, 2010 - Tor Books, an imprint of Tom Doherty Associates, LLC—the largest publisher of science fiction in the world—is pleased to reveal the title, cover art, and release month of Halo: Cryptum, the first in a trilogy of novels by Hugo and Nebula award-winning author Greg Bear in the New York Timesbestselling “Halo” series based on the hugely successful “Halo” video games franchise for the Xbox 360. Halo: Cryptum will be published in January 2011. An unabridged audio book edition will publish simultaneously with the new novel. Halo: Cryptum will begin the first deep exploration into the time of the Forerunners, the creators and builders of the Halos. Almost nothing is known for sure about this ancient race. Worshipped by the Covenant as gods, their engineering relics pepper the galaxy, and their connection to humanity remains unanswered. Devoted fans of both the books and games will finally get to delve deep into the era of these enigmatic beings, and discover for themselves the epic story behind one of the great mysteries of the “Halo” universe: the complete disappearance of the Forerunners from existence. "The enigma of the Forerunners is really at the heart of the drama and mystery of the Halo universe," says Frank O'Connor, Franchise Development Director for 343 Industries. "In all the games and the books so far we've only scratched the surface of the terrible events that engulfed the Forerunners and the Galaxy they protected 100,000 years ago, and we're very lucky to have a writer with Greg's experience and creativity to help us finally shed some light on why the Halos are really here."